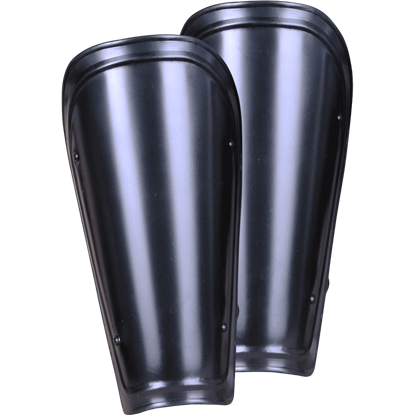 Just as bracers or gauntlets are important for protecting the hands and forearms, greaves are important for protecting the lower leg. 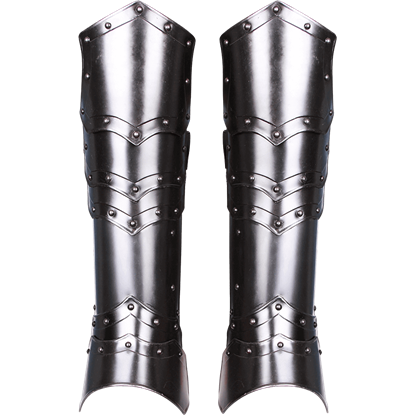 And at Medieval Armour, you not only have a selection of functional steel greaves to choose from, but you also have a selection of incredible looking medieval greaves, which come in a wide assortment of different styles. They range from standard steel greaves to blackened steel greaves, to embossed greaves that feature simple design touches across their surface for a bit of minor aesthetic enhancement. They're also offered from a variety of different cultures and eras, ranging from the fantasy era of elven greaves and orcish greaves to the historic era of Spartan greaves and roman greaves. And that's not even counting all the warrior greaves we offer that are fit for virtually any medieval fighter, whether he (or she) be a knight, a soldier, a brigand, an archer, or anything else. 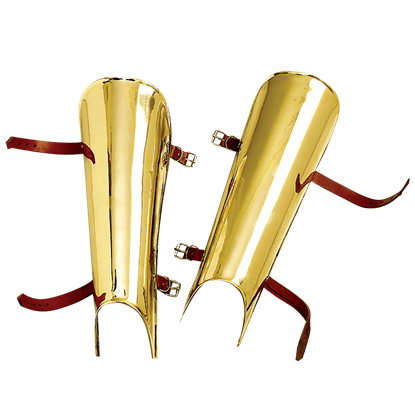 Being steel armour, these sets of greaves all make for wonderful SCA greaves, as well as great LARP armour, providing a healthy dose of protection as well as an impressive touch that will make any costume or outfit look authentic and armoured. Are you worried about keeping your legs protected in your next fight? 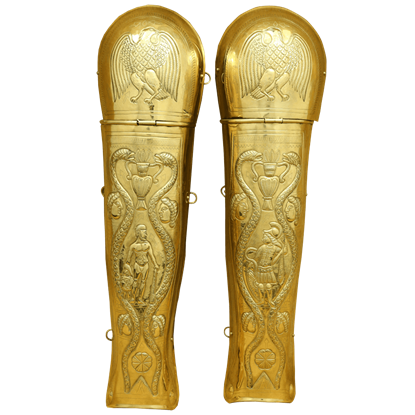 Then take a moment to browse through our steel greaves here at Medieval Armour, and once you find one that suits your need and your personal tastes, pick them up and put them on...and you'll no longer have to worry about a blade cutting your legs right out from under you. 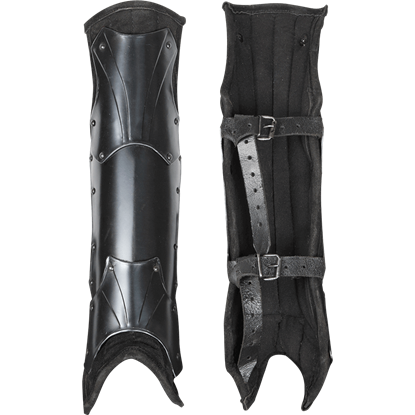 The Blackened Adam Greaves make an excellent choice for leg protection when you are heading into the fray of battle. 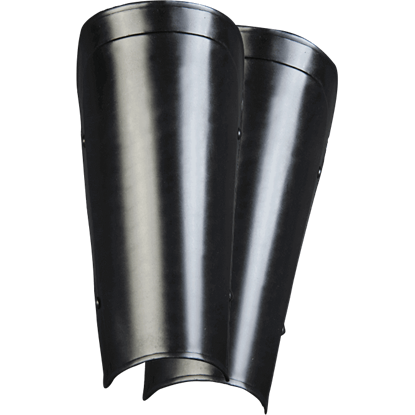 These steel greaves display a dark metal finish that will go superbly with other pieces of LARP armour. 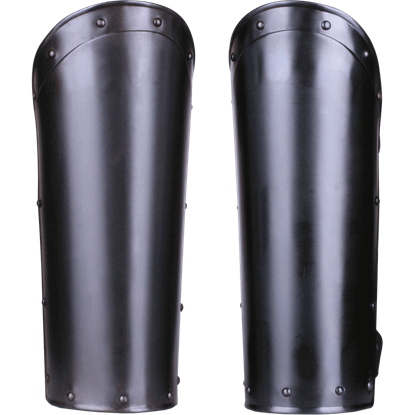 Keeping mobile on the battlefield is critical, so guard your legs with the help of plate armour like the Blackened Balthasar Greaves. 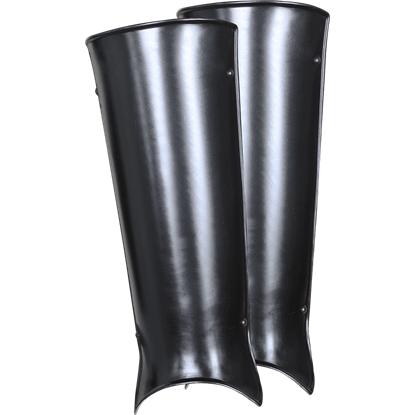 These steel greaves feature a dark metal finish that suits medieval warlords and mercenaries. 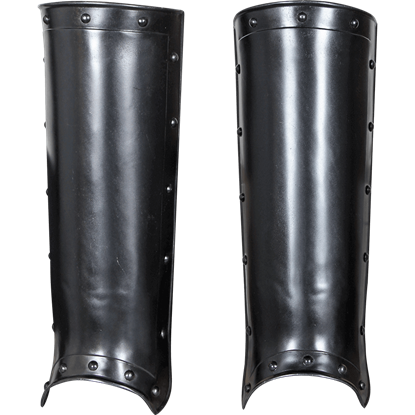 Combining comfort and protection, the Blackened Fafnir Greaves make a superb choice for LARP battles and re-enactments. The steel greaves are crafted with metal plates that are riveted on a backing of padded suede leather. Wear the Blackened Georg Greaves to add style and protection to any LARP outfit. 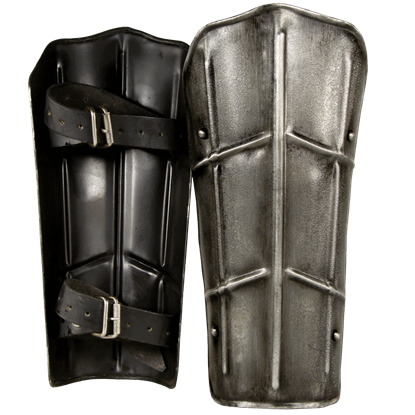 Made of 16 gauge steel, these greaves feature a classic design, with decorative grommets adorning their outer edges. They are sold in sets of two. The Blackened Jost Greaves showcase a striking look, displaying a riveted trim along the edges of the design. 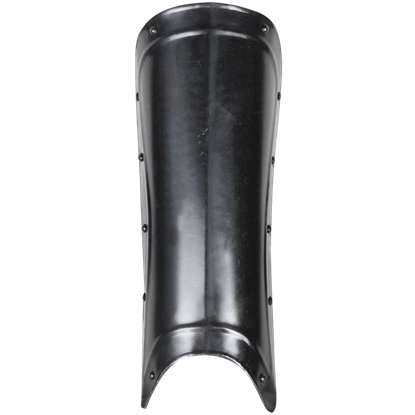 This pair of steel greaves offers coverage from your knee to ankle with a distinctive outward curve at the bottom. Fortify your lower legs against the blows of a sneaky foe. During a fierce LARP battle, a quick kick to the shins is a guarantee. Strengthen your defense and maintain your footing with the Blackened Lucas Youth Greavescovering said limbs. The Blackened Markward Greaves features a simple yet elegant design, showing off a dark metal finish and smooth curves on the sides of the top. A central bend runs down the front, adding strength and stiffness to the steel greaves. Step confidently into battle with the Dark Drake Steel Greaves providing necessary protection to your lower legs. 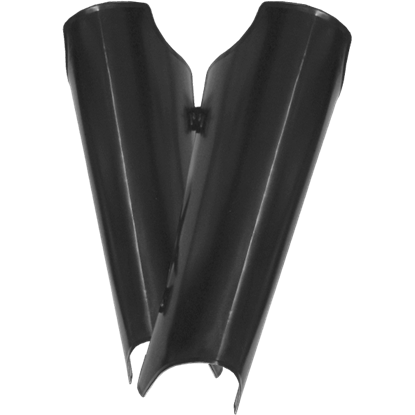 These shin guards feature a unique raised pattern and a dark metal finish, suitable for a battlemage or dark knight.